WOW…. I couldn’t write my blog on job-assessment/review because I haven’t had a real one in a couple years….Last one, years ago was handle to me and had checks on it – your doing great and sign here. I have a new boss this year who I doubt actually knows what I should be doing at my job so I think my annual review will not be very relevant. Maybe it will be an opportunity for her to learn about my job since she doesn’t seem to be paying much attention to me yet. I prefer for the supervisor to pop into my classroom on a regular basis throughout the year and use that as the basis for my formal evaluation write up. I think that a one time summative- 42 minute visit into a classroom does not yield a knowledgeable and informative picture of a teachers abilities and strengths. I believe that it is the supervisors responsibility to know what is happening in the classroom on a regular basis and I really do not like the idea of co-workers being responsible for taking on that role. Nicely summarized Dana. I love your suggestions on how to wrap a UDL lens around this evaluation situation. Sounds like you may have some information to share with others? Do you think this evaluation process can be revised through a UDL lens? Would this require a change to the system and if so, how would you propose this change? I think that the self-evaluation component currently in place is important and should be retained in any personnel evaluation process. It could be improved upon by building in questions that address the various ways the staff person acquires information/knowledge and demonstrates what s/he knows — for example…recognition networks (how do you gather and make use of work data? ), strategic networks (in what ways do you interact with your environment? ), and affective networks (describe some of your social interactions with customers, co-workers). In addition, the evaluation should be more frequent, perhaps quarterly, so that there are opportunities for continual feedback. And, it would be interesting to have opportunities for staff to develop a portfolio (products, photos, etc) that highlight their job experience. We just had professional development on new administrator/teacher evaluations. 50% is based on qualitative data and the other 50 is based on quantitative data regarding student achievement. It is not that simple, of course. 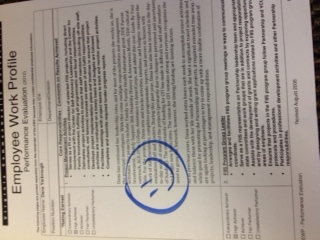 I love the new format we are using for the qualitative data (not just 2 observations a year)! I do believe in accountability, but have reservations about 50% based on test scores. This also brings into question how special educators will be evaluated. Any thoughts….